I've just started using mind mapping (with MindNode) to outline the passages in 2 Samuel I've been preaching on this month. It's really helpful! I tried mind mapping a while ago, but it didn't connect with me. Now it has. MindNode (and probably other similar apps, I'd guess) allows you to export your mind map a number of ways, including as a text outline. So now I have begun by mind mapping the passage--from which eventually emerges a sermon outline--then exporting the mind map as a text outline, and from that (and with that focus) doing my text research in Accordance. Does anyone else here use mind mapping? Curious to hear about best practices, useful programs/apps for it (pencil and paper is still good! ), etc. The reason i like visio is that its not too automated so i can position where i want to and am not being driven by the program but it has a lot of power when required with its underlying database. Plus after outlook and word, its the office tool i use most, quickly followed by oneNote and access and project, (despite people trying to Force me to use iGrafx). I do not use mind mapping much anymore (I used to use it a great deal when I worked in sales training and as a professor). The app for iOS I liked the most was Mindly (I used the free version). I have purchased Scapple for use on my Mac. It does some exporting, but not sure if it is more versatile than MindNode. I have used MindNode light and it worked ok. IT might be good to get someone else involved (if possible). Thanks, guys--Fraser, I didn't realize there was an actual inventor of mind mapping, but that makes sense. I checked out some of his stuff. Tim--thanks for the app recommendations. And great suggestion about getting ideas down and connecting them later. I'll try that more. I used to use NovaMind a lot until it just became too complicated, I disliked the new interface, and is now a rent-to-use application. I still use Simplemind, and Delineato. The "official" Buzan stuff is just way too expensive. Edited by Alistair, 20 July 2015 - 06:47 AM. I am finding a proliferation of what appear to be suitable mind mapping apps! Coggle.it is free and its feature set seems to increase over time. In another context I've shared my appreciation for mindmapping software as contrasted against various outlining tools on OSX and iOS. I find iThoughtsX more flexible than OmniOutliner as an outliner let alone the ability to restructure using drag and drop and simple roll-up functionality. For a pure outliner, I'm not sure Word's outline tools can be beat, but for laying out a sermon or an article, iThoughts is much more flexible for me. Rolling up the mindmap to its major points makes a great set of notes for preaching with an iPad. On the other hand, a markdown editor that could do outlining (yes, I know I can do it with headers but that ends up being an ugly solution and the auto-numbering tools are all clunky) and roll up outline details would make for a much simpler workflow. Folding Texts is as close as I've come to a markdown editor that might work for a sermon outliner. In the end, the ability to work visually with structure makes the extra workflow tool a reasonable solution for me. iThoughtx has great import and export functionality and bridges to and from my plain text workflow. That's a very cool site, Chuck. Thanks! Clint, I appreciate your thoughts. This week I'm going to really give OmniOutliner a go. Was able to easily import a mind map to it from MindNode (and Scapple). So far, so good, but I would love to hear more of your experience with it, especially around any limitations. The sync to iOS isn't great....it relies on Omni's custom sync engine. Why do that when Dropbox works great.....and of course iThoughtsX can use Dropbox? You can't restart a numbering sequence in OmniOutliner. I know that sounds small, but its one of the big things an outliner should do, attach an appropriate (for me Cambridge) numbering sequence to an outline. Word does this soooooo well, why can't a dedicated outlining app do it? My left-brain and my right-brain are at war when it comes to preaching, but I'm really liking the visual representation you get from a mindmap which, for me, encourages the right-brain stuff. OmniOutliner feels to me like a left-brain tool and I guess my preaching could use a lot more right brain stimulation. Please do post your experiences with OmniOutliner. I'm anxious to see if you think it brings anything to your workflow that you can't get from a good mind mapping app. I'm just getting ready to step back into a parish and have been working on nailing down my workflow for exegesis and preaching. This is really helpful, Clint--thank you. OmniOutliner now requires a bit of fussing to set up sync on desktop, but once you do, everything is automatic between OSX and iOS. One thing I like about it is that it's on iPhone, iPad and Mac--but that's true of iThoughts, too, isn't it? I hear what you're saying in your third point. So after outlining, do you mean you're still doing some serious fleshing out within iThoughts? Or are you right into a word processor at that point? For example--let's say one of my points centers on a verse in a passage, and I want to explore some things in Accordance and copy/paste/write into a verse-tied User Note. Where would that go in your workflow? I guess a key component for me is "Research," which as of now begins in Accordance and ends in Scrivener. Will do--I've been tweaking my workflow again recently, too. Recently used essential tools have been: Accordance (of course), Ulysses (awesome, but I have mixed feelings about markdown--and it's not on iPhone yet), Scrivener (amazing in every way--but no iOS yet), MindNode (cross-platform for Apple and excellent), and Nisus Writer Pro (but no iOS) or Mellel (with new iPad app) for the manuscript writing. One possible advantage to OmniOutliner is that I can finish my mind map for an outline, and then export to OO, and then add lots of text notes (e.g., stuff from Accordance User Notes) without it being as bulky as I imagine it would be in a mind map program (even allowing that mind map apps have notes popovers)... what do you think? Yes, I go from iThoughtsX right into my "bucket" app then on to my text editor (Ulysses in my case). I'm not sure what I'd gain by going from iThoughtsX to OmniOutliner? My central container is Circus Ponies Notebooks. I fritzed with Scrivener, but Notebooks is a great place to collect all my notes, references, illustrations, etc. It imports and exports OPML (and is as powerful an outliner in its own right as OO), has phenomenal web clipping functionality, can link to anything that can produce a URL. There is an iPad version, though an iPhone version isn't coming any time soon. Development of Notebooks isn't aggressive, but IMO its a far better bucket app than OneNote, far less complex than Scrivener and I think far easier to search for a specific item or note. I try to keep all my exegetical, textual and theological notes in Logos (Accordance would work as well, I just prefer a few of the minor features of Logos). I tried keeping them as plain text files which worked, but I'm convinced they have more function in Logos (or Accordance). Since I've always got Logos open, I don't move those notes into Notebooks, though I could just copy and paste them. The Holy Grail for me would be something like nvAlt (or Devonthink or whatever) with dynamic linking to the "big three" bible study packages. I'd love to have platform agnostic notes, but don't have the time to develop it myself and doubt the market is large enough for someone to commercially develop it. I end up with two big note collections: the plain text collection (all clippings, illustrations, quotes, etc.) and all the biblical and theological notes in Logos. I'd like to preserve enough of my sermon work to follow my own thoughts through a series a few years later. When I'm done I've got my Notebooks with texts, critical cross references and non-canonical citations, outline, illustrations, notes, citations, etc, and the sermon text. Just writing out the workflow sounds too complex? Had never heard of Circus Ponies, but sounds interesting. Looking through the site, it reminds me a bit of Evernote, though with a more user-friendly interface. "Just writing out the workflow sounds too complex?" --yes, I resonate with that a great deal! It's a balance, wanting to find the ever-elusive perfect workflow (which doesn't exist) vs. doing profitable workflow tweaks that actually enable more effective sermon prep. Hopefully it's the latter we're doing! Edited by Abram K-J, 21 July 2015 - 07:04 PM. A couple of things about Notebooks I've come to love. Like OneNote on Windows and OSX, you can record audio and your written notes are bookmarked in the audio recording. The audio recording / syncing to notes also works in the iOS version as well, unlike OneNote. A great tool for keeping notes on meetings. Like iThoughtsX, it has strong import and export capabilities. I've also discovered that DevonThink can index Notebook files. You don't want to store the Notebook files in the DT file store (rumors of some very bad things that can happen), but you can index them with DT easily. The interface is a bit unique (it was originally developed for the Next OS and ported to OSX), but it's wonderfully flexible. The sync to iOS works well for the most part. Edited by Clint Cozier, 23 July 2015 - 05:27 AM. I should mention Tree, though it's not a mind map tool strictly speaking. Sigh... yet another awesome app to look into. Thanks for the tip--looks pretty neat. I've had a little conversation with Abram over on his blog about this. I'm becoming a big fan of OmniOutliner - when I use it well. I came to the realisation earlier this year that I wasn't thinking well about the structure of sermons, and in particular the flow - how does one point connect with the next. I also have a bad habit of starting to write a draft before I've got a thorough plan. So now I'm using OmniOutliner as place to jot down 'big picture' thoughts for a sermon - what's the big idea what's the main application etc. and then to write a fairly thorough outline. Then I retype the headings into my Pages sermon template and keep the outline open whilst I draft in Pages. I haven't found much use in exporting from OO. Mindmapping isn't a regular part of my workflow when doing my normal expository/lectio continua sermons - though at times when I'm really stuck in exegesis I've found it a useful way out. 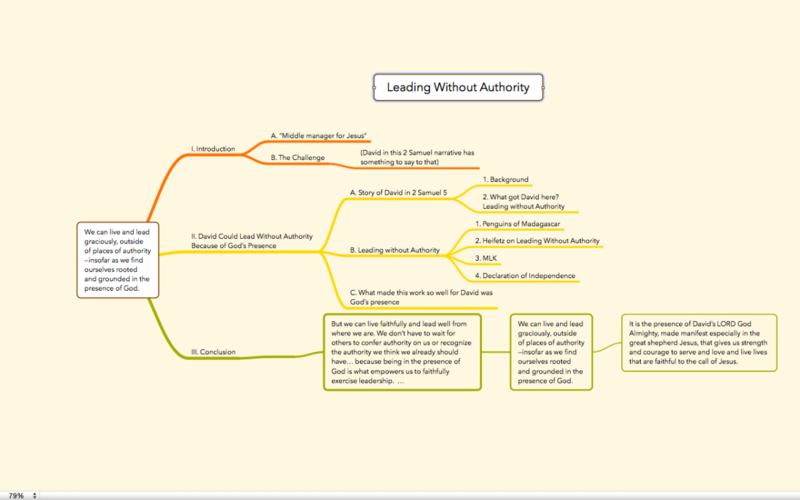 Though I normally make a mind map as part of brainstorming for topical/doctrinal/ethical sermons and sermon series. I hear your question about working with word count vs. page count. I wrote my manuscripts out in Word / Mellel for years, then went on a markdown / plain text kick and haven't looked back. For me, the real magic of writing a sermon manuscript is in making explicit connections and working with flow. I never take a manuscript with me to preach, but I find the exercise of thinking explicitly through transitions transforms my collection of pearls into a cohesive whole. I tend to write what I write...I don't think about page count. If it goes long (sometimes I feel lost in my own sermon or like there are two sermons fighting with each other to get out), then I will preview (I used Marked 2, so the process of getting a preview is simple) and check my page count. I now have a good feel for how many words make up a usable sermon and find that I consistently produce sermons weekly that are within half a page of each other in length. I might feel differently if I used the manuscript in my delivery or didn't feel comfortable adjusting (adding, reordering and cutting) on the fly.